Hong Yan received his Ph.D. degree from Yale University. He was professor of imaging science at the University of Sydney and currently is chair professor of computer engineering at City University of Hong Kong (CityU). He is a former Dean of the College of Science and Engineering at CityU. 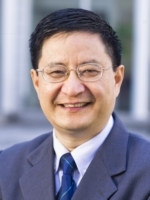 Professor Yan was elected an IAPR fellow for contributions to document image analysis and an IEEE fellow for contributions to image recognition techniques and applications. He received the 2016 Norbert Wiener Award from IEEE SMC Society for contributions to image and biomolecular pattern recognition techniques. C. Cui, Q. Li, L. Qi, and H. Yan, "A quadratic penalty method for hypergraph matching," Journal of Global Optimization, 70(1):237-259, 2018. L. Sun, B. Zheng, J. Zhou, and H. Yan, "Some inequalities for the Hadamard product of tensors," Linear and Multilinear Algebra, 66(6):1199-1214, 2018. J. Chang, W. Ding, L. Qi, and H. Yan, "Computing the p-spectral radii of uniform hypergraphs with applications," Journal of Scientific Computing, 75(1):1-25, 2018. H. Kuang, K. F. Yang, L. Chen, Y. J. Li, L. L. H. Chan, and H Yan, "Bayes saliency-based object proposal generator for nighttime traffic images," IEEE Transactions on Intelligent Transportation Systems, 9(3):14-825, 2018. T. D. Pham and H. Yan, "Tensor decomposition of gait dynamics in Parkinson's disease," IEEE Transactions on Biomedical Engineering, 65:(8):1820-1827, 2018. L. Ma, D. D. Wang, B. Zou, and H. Yan, "An eigen-binding site based method for the analysis of anti-EGFR drug resistance in lung cancer treatment," IEEE/ACM Transactions on Computational Biology and Bioinformatics , 14(5):1187-1194, 2017. B. Zou, V. H. F. Lee, L. Chen, L. C. Ma, D. D. Wang, and H. Yan, "Deciphering mechanisms of acquired T790M mutation after EGFR inhibitors for NSCLC by computational simulations," Scientific Reports, 7(1):6595:1-13, 2017. S. Khan, G. Xu, R. Chan, and H. Yan, "An online spatio-temporal tensor learning model for visual tracking and its applications to facial expression recognition," Expert Systems With Applications, 90:427-438, 2017. H. Yan, "Co-clustering of multidimensional big data, a useful tool for genomic, financial and other data analysis," IEEE Systems, Man and Cybernetics Magazine, 3(2):23-30, 2017. X. L. Xu, C. X. Ren, R. C. Wu, and H. Yan, "Sliced inverse regression with adaptive spectral sparsity for dimension reduction," IEEE Transactions on Cybernetics, 47(3):759-771, 2017. H. Kuang, X. Zhang, Y. J. Li, L. L. H. Chan, and H. Yan, "Nighttime vehicle detection based on bio-inspired image enhancement and weighted score-level feature fusion," IEEE Transactions on Intelligent Transportation Systems, 18(4):927-936, 2017. L. Chen, X. Mao, and H. Yan, "Text-independent phoneme segmentation combining egg and speech data," IEEE/ACM Transactions on Audio, Speech, And Language Processing, 24(6):1029-1037, 2016. L. Chen, Z. Zhao, H. Yan, "A probabilistic relaxation labeling (PRL) based method for c. elegans cell tracking in microscopic image sequences," IEEE Journal of Selected Topics in Signal Processing, 10(1):185-192, 2016. Z. Shen, D. D. Wang, L. Ma, H. Yan, M. P. Wong, and V. H. F. Lee, "A computational study of three frequent mutations of EGFR and their effects on protein dimer formation and non-small cell lung cancer drug resistance," Current Bioinformatics, 11(3):382-391, 2016. H. Yan, "Engineering education in China," International Conference on Interactive Collaborative Learning, 1098-1101, 2015. B. B. Liu, C. W. Yu, D. Z. Wang, R. C. C. Cheung, and H. Yan, "Design exploration of geometric biclustering for microarray data analysis in data mining," IEEE Transactions on Parallel and Distributed Systems, 25(10):2540-2550, 2014. D. D. Wang, R. Wang and H. Yan, "Fast prediction of protein-protein interaction sites based on extreme learning machines," Neurocomputing, 128:258-266, 2014. L. Ma, D. D. Wang, Y. Huang, M. P. Wong, V. H. F. Lee, and H. Yan, "Decoding the EGFR mutation-induced drug resistance in lung cancer treatment by local surface geometric properties," Computers in Biology and Medicine, 2014. J. Mazgut, P. Tino, M. Boden, and H. Yan, "Dimensionality reduction and topographic mapping of binary tensors," Pattern Analysis and Applications, 17(3):497-515, 2014. Y. Zhu, W. Zhou, D. Q. Dai, and H. Yan, "Identification of DNA-binding and protein-binding proteins using enhanced graph wavelet features," IEEE/ACM Transactions on Computational Biology and Bioinformatics, 10(4):1017-1031, 2013. B. Min, R. C. C. Cheung, and H. Yan, "A flexible and customizable architecture for the relaxation labeling algorithm," IEEE Transactions on Circuits and Systems, 60(2):106-110, 2013. N. Y. Song and H. Yan, "Autoregressive and iterative hidden Markov models for periodicity detection and solenoid structure recognition in protein sequences," IEEE Journal of Biomedical and Health Informatics, 17(2):436-441, 2013. D. Z. Wang and H. Yan, "A graph spectrum based geometric biclustering algorithm," Journal of Theoretical Biology, 317:200-211, 2013. C. X. Ren, D. Q. Dai, and H. Yan, "Coupled kernel embedding for low resolution face image recognition," IEEE Transactions on Image Processing, 21(8):3770-3783, 2012. M. Y. Wu, D. Q. Dai, Y. Shi, H. Yan, and X. F. Zhang, "Biomarker identification and cancer classification based on microarray data using Laplace naive Bayes model with mean shrinkage," IEEE/ACM Transactions on Computational Biology and Bioinformatics, 9(6):1649-1662, 2012. M. Y. Wu, D. Q. Dai, and H. Yan, "PRL-Dock: protein-ligand docking based on hydrogen bond matching and probabilistic relaxation labeling," Proteins: Structure, Function and Bioinformatics, 80:2137-2153, 2012. X. Yang and H. Yan, "Analysis of DNA deformation patterns in nucleosome core particles based on isometric feature mapping and continuous wavelet transform," Chemical Physics Letters, 547:73-81, 2012. W. F. Zhang and H. Yan, "Exon prediction using empirical mode decomposition and Fourier transform of structural profiles of DNA sequences," Pattern Recognition, 45(3):947-955, 2012. P. Tino, H. Y. Zhao, and H. Yan, "Searching for coexpressed genes in three-color cDNA microarray data using a probabilistic model-based Hough transform," IEEE/ACM Transactions on Computational Biology and Bioinformatics, 8(4):1093-1107, 2011. J. Zeng, X. Y. Zhao, X. Q. Cao, and H. Yan, "SCS: Signal, context, and structure features for genome-wide human promoter recognition," IEEE/ACM Transactions on Computational Biology and Bioinformatics, 7(3):550-562, 2011. W. H. Yang, D. Q. Dai, and H. Yan, "Finding correlated biclusters from gene expression data," IEEE Transactions on Knowledge and Data Engineering, 23(4):568-584, 2011. W. Q. Zhou and H. Yan, "A discriminatory function for prediction of protein-DNA interactions based on alpha shape modeling," Bioinformatics, 26(20):2541-2548, 2010. W. Q. Zhou and H. Yan, "Relationship between periodic dinucleotides and the nucleosome structure revealed by alpha shape modeling," Chemical Physics Letters, 489(4-6):225-228, 2010. W. F. Zhang, D. Q. Dai, and H. Yan, "Framelet kernels with applications to support vector regression and regularization networks," IEEE Transactions on Systems, Man, and Cybernetics, Part B, 40(4): 1128-1144, 2010. W. F. Zhang, C. C. Liu, and H. Yan, "Clustering of temporal gene expression data by regularized spline regression and an energy based similarity measure," Pattern Recognition, 43:3969-3976, 2010. J. Zeng, S. Zhu, A. W. C. Liew, and H. Yan, "Multiconstrained gene clustering based on generalized projections," BMC Bioinformatics, 11:164.1-164.13, 2010. X. Cao, J. Zeng and H. Yan, "Physical signals for protein-DNA recognition," Physical Biology, 6(3):036012.1-036012-10, 2009. M. A. Amin and H. Yan, "An empirical study on the characteristics of Gabor representations for face recognition," International Journal of Pattern Recognition and Artificial Intelligence, 23(3):401-431, 2009. H. X. Zhou, L. Du, and H. Yan, "Detection of tandem repeats in DNA sequences based on parametric spectral estimation," IEEE Transactions on Information Technology in Biomedicine, 13(5):747-755, 2009. M. K. Choong, M. Charbit and and H. Yan, "Autoregressive model based missing value estimation for DNA microarray time series data," IEEE Transactions on Information Technology in Biomedicine, 13(1):131-137, 2009. B. S. Y. Lam and H. Yan, "A novel vessel segmentation algorithm for pathological retinal images based on the divergence of vector fields," IEEE Transactions on Medical Imaging, 27(2):237-246, 2008. W. H. Yang, D. Q. Dai and H. Yan, "Feature extraction and uncorrelated discriminant analysis for high-dimensional data," IEEE Transactions on Knowledge and Data Engineering, 20(5):601-614, 2008. X. Q. Cao, J. Zeng and and H. Yan, "Structural property of regulatory elements in human promoters," Physical Review E, 77:041908:1-7, 2008. R. Jiang and H. Yan, "Studies of spectral properties of short genes using the wavelet subspace Hilbert-Huang transform (WSHHT)," Physica A, 387:4223-4247, 2008. H. Zhao, A. W. C. Liew, X. Xie and H. Yan, "A new geometric biclustering algorithm based on the Hough transform for analysis of large-scale microarray data," Journal of Theoretical Biology, 251(3):264-274, 2008. H. Zhao and H. Yan, "HoughFeature, a novel method for assessing drug effects in three-color cDNA microarray experiments," BMC Bioinformatics, 8:256, 2007. H. Yan and T. Pham, "Spectral estimation techniques for DNA sequence and microarray data analysis," Current Bioinformatics, 2(2):145-156, 2007. C. C. Liu, D. Q. Dai, and H. Yan, "Local discriminant wavelet packet coordinates for face recognition," Journal of Machine Learning Research, 8:1165-1195, 2007. S. Wu, X. Xie, A. Liew and H. Yan, "Eukaryotic promoter prediction based on relative entropy and positional information," Physical Review E, 75:041908:1-7, 2007. A. Liew, J. Xian, S. Wu, D. Smith, and H. Yan, "Spectral estimation in unevenly sampled space of periodically expressed microarray time series data," BMC Bioinformatics, 8:137:1-19, 2007. L. Du, H. Zhou and H. Yan, "OMWSA: detection of DNA repeats using moving window spectral analysis," Bioinformatics, 23(5):631-633, 2007. X. Xie, S. Wu, K. Lam and H. Yan, "PromoterExplorer: an effective promoter identification method based on the AdaBoost algorithm," Bioinformatics, 22(22):2722-2728, 2006. B. S. Y. Lam and H. Yan, "Subdimension-based similarity measure for DNA microarray data clustering," Physical Review E, 74:041906:1-8, 2006. T. D. Pham, D. Beck, and H. Yan, "Spectral pattern comparison methods for cancer classification based on microarray gene expression data," IEEE Transactions on Circuits and Systems I, 53(11):2425-2430, 2006. X. Gan, A. Liew and H. Yan, "Microarray missing data imputation based on a set theoretic framework and biological knowledge," Nucleic Acids Research, 34(5):1608-1619, 2006. M. Sakalli, K. Lam, and H. Yan, "A faster converging snake algorithm to locate object boundaries," IEEE Transactions on Image Processing, 15(5):1182-1191, 2006. H. Yan, "Efficient matching and retrieval of gene expression time series data based on spectral information," in Lecture Notes in Computer Science, Volume 3482, Osvaldo Gervasi, Marina L. Gavrilova, Vipin Kumar (eds), 357-373, Springer-Verlag GmbH, 2005. L. K. Yeung, L. K. Szeto, A. W. C. Liew and H. Yan, "Dominant spectral component analysis for transcriptional regulations using microarray time-series data," Bioinformatics, 20(5):742-749, 2004. S. Wu, A. W. C. Liew, H. Yan and M. Yang, "Cluster analysis of gene expression data based on self-splitting and merging competitive learning,", IEEE Transactions on Information Technology in Biomedicine, 8(1):5- 15, 2004. H. Yan, "Convergence condition and efficient implementation of the FCT algorithm," IEEE Transactions on Systems, Man and Cybernetics B, 34(1):210-221, 2004. Y. Xiao and H. Yan, "Text extraction in document images based on Delaunay triangulation," Pattern Recognition, 36(3):799-809, 2003. Y. Wu, A. W. C. Liew, H. Yan and M. Yang, "Classification of short human exons and introns based on statistical features," Physical Review E, 67:061916:1-7, 2003. C. Weerasinghe, A. Liew and H. Yan, "Artifact reduction in compressed images based on region homogeneity constraints using projection on to convex sets algorithm," IEEE Transactions on Circuits and Systems for Video Technology, 12(10):891-897, 2002. H. Yan (ed. ), Signal Processing for Magnetic Resonance Imaging and Spectroscopy, Marcel Dekkek Inc., 2002. H. Yan, "Human face image processing techniques," International Journal of Image and Graphics, 1(2):197-215, 2001. H. Yan, "Image analysis for digital media applications," IEEE Computer Graphics and Applications, 21(1):18-26, 2001. P. E. Mitchell and H. Yan, "Document page segmentation based on pattern spread analysis," Optical Engineering, 39(3):724-734, 2000. T. Kondo and H. Yan, "Automatic human face detection and recognition under non-uniform illumination," Pattern Recognition, 3(10), 1707-1718, 1999. H. H. Chang and H. Yan, "Analysis of stroke structure of handwritten Chinese characters," IEEE Transactions on Systems, Man and Cybernetics, 29(1):47-61, 1999. K. Lam and H. Yan, "An analytic-to-holistic approach for face recognition based on a single frontal view," IEEE Transactions on Pattern. Analysis and Machine Intelligence, 20(7):673-686, 1998. A. R Mirhosseini, H. Yan, K. Lam, and T. Pham, "Human face image recognition: An evidence aggregation approach," Computer Vision and Image Understanding, 71(2):213-230, 1998. H. Hu and H. Yan, "Polygonal approximation of digital curves based on the principles of perceptual organization," Pattern Recognition, 30(5):701-718, 1997. D. Popescu and H. Yan, "A non-linear model for fractal image coding," IEEE Transactions on Image Processing, 6(3):373-382, 1997. K. Lam and H. Yan, "Locating and extracting the eye in human face images," Pattern Recognition, 29(5):771-779, 1996. Z. Chi, M. Suters, and H. Yan, "Separation of single-and double-touching handwritten numeral strings," Optical Engineering, 34(4):1159-1166, 1995.